Jackpoint ID: Not on board yet! Saul Chronic, Real SIN. Records on file with Saeder-Krupp Heavy Industries. Traded info to Dr. Faustus Society to clear his name. Morris Katz, mediator. Rating 1. Manishevitz Guberman, security consultant. Rating 1. Shlomo Dank, Security Mage, R6 with licenses. Born and raised in a Saeder-Krupp Arcology in the Frankfurt sprawl to German-Jewish parents Karl and Marina. Karl studied engineering at University and after graduating was employed by the Saeder-Krupp corporation, prospering there and becoming a talented life-long sarariman. The younger and more adventurous Marina enjoyed traveling and religious/spiritual studies, she frequently visited Israel, and was devestated by Jerusalem’s abandonment. After Saul’s awakening at the age of thirteen he was enrolled in a Saeder-Krupp school for magically skilled youths, in Essen. 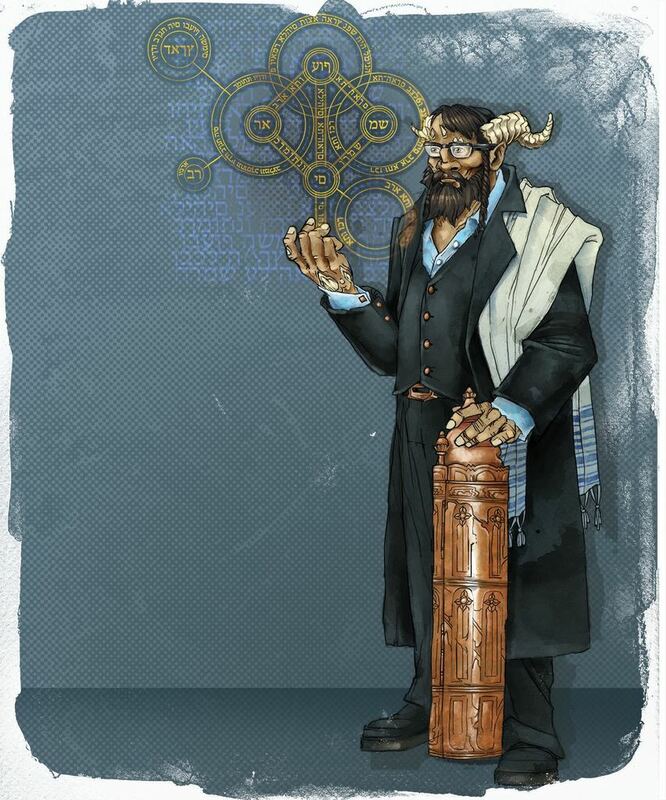 There he was closely mentored by Chyim Falk, a Jewish Mage and religious scholar who Marina greatly respected. Marina and Chyim viewed Saul’s abilities as a Godly gift. Saul’s intense studies, Karl’s work, and Marina’s travels kept the family apart, they would often go weeks without seeing each other at all. Saul’s parent’s relationship deteriorated and during one of Marina’s lengthy trips to Israel, Saul was told by his father that his mother would not be returning home. At the time this seemed to make sense, his parents were clearly not happy together, only after a year passed with no communication from Marina did Saul begin to question the reason for her absence. Karl became more obsessed with his work and isolated himself from Saul and would never speak of Marina. Chyim continued to foster Saul during this time and helped him focus his magical powers to be used in the protection of Corp utilities and personnel. Saul became a favored Saeder-Krupp security mage and traveled to contested Corp regions to protect against rival hostile take-over attempts. While securing a corp post in the middle east with Chyim’s assistance, Saul battled a Shedim spirit who inhabited Chyim’s body while he was astrally projecting. Saul fought and eventually banished the spirit, but Chyim’s body was badly damaged and he was lost. Soon after this Karl Chronic also passed away. Now alone, Saul decided to take time away from Corp life and has recently been toying with free-lance shawdowrunning. He hopes to find answers about what happened to his mother, and also to continue to battle Shedim, wherever he may encounter them.